Hillary Clinton and Tim Kaine during a rally at McGonigle Hall at Temple University in Philadelphia on July 29. A new ABC News/Washington Post national poll published on Sunday showed Clinton up 8 percentage points among registered voters. Clinton’s lead jumped 4 points compared to the previous ABC News/Washington survey, conducted before the conventions. A Morning Consult poll, also published Sunday, also found Clinton up 8 points among registered voters. Clinton was up 5 percentage points in the same poll last weekend, conducted after both conventions. That is, Clinton’s post-convention surge has continued in Morning Consult’s polling. Two national tracking polls which have generally shown good numbers for Trump also found Clinton building or holding onto her post-convention bounce. Clinton led by 1 percentage point in the latest USC Dornsife/LA Times survey, and by 6 points in the CVOTER International poll — both matching her largest leads from those pollsters. The only poll showing any real sign of decay in Clinton’s lead is the Ipsos tracking poll, which had Clinton up 2 percentage points as of Friday, down a few points from earlier in the week. 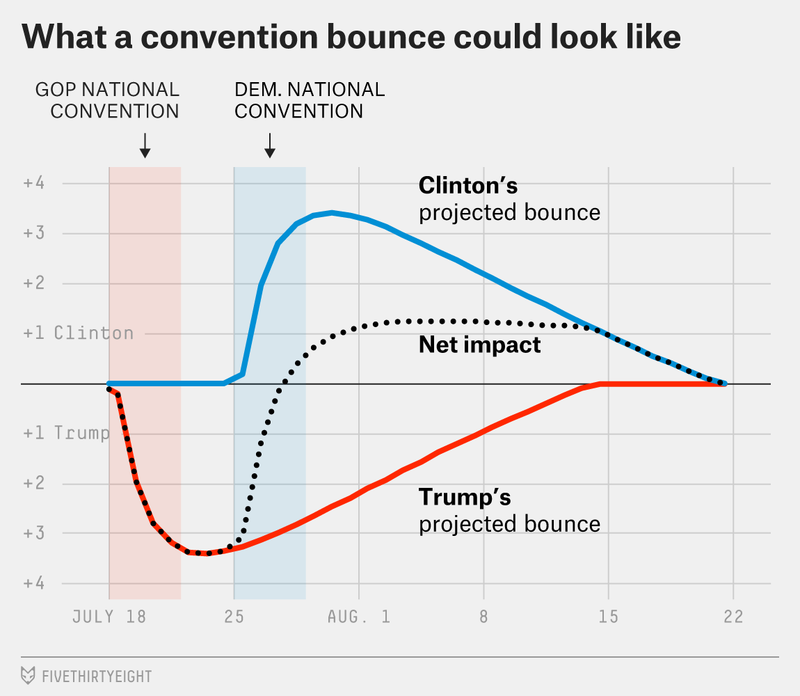 For now, it is an outlier, and most polls have Clinton’s bounce holding or expanding. Clinton notched an 11-percentage-point edge in Michigan in an EPIC-MRA survey. And she led Trump by 12 points in a new YouGov survey of Virginia. Our best bet: Wait a couple more weeks to see where the dust settles. Our now-cast, for example, which projects what would happen in a hypothetical election held today, has Clinton winning the popular vote by 8 percentage points. My guess is that that will tick down a couple of points in the coming days. Our polls-plus model, which accounts for convention bounces and so discounts some of Clinton’s recent surge, projects her to win on Nov. 8 by 4 points. And our polls-only model, which basically takes the polls at face-value, projects her to win by 7. But it’s also possible that Clinton’s strong numbers aren’t solely the result of a fleeting post-convention afterglow. As my colleague Nate Silver pointed out on Friday, Trump’s recent struggles — his attacks on the Khan family and feuds with Republican leadership, for instance — could be inflicting more durable damage to his chances. Trump is the least-liked major party nominee in modern history. Perhaps the conventions and their aftermath, when many voters presumably tuned into the 2016 race for the first time, established a new equilibrium. Perhaps this is 1988 all over again, with the parties reversed. In 1988, Republican George H.W. Bush, looking to succeed an increasingly popular Ronald Reagan and give his party a third term in the White House, was trailing Democrat Michael Dukakis going into the conventions. But the conventions reset the race. Immediately after the conventions, Bush led Dukakis by an average of about 6 percentage points. In November, Bush defeated Dukakis by 8 points. Now, this year could end up being very different than 1988. Like Bush in 1988, however, Clinton is trying to replace a two-term president from her party whose popularity has been growing. Still, Trump is an unprecedented candidate, so looking to history is only so useful. My best advice is patience. Clinton clearly has a better shot of winning this election than Trump. Just how much better will become clearer in the next few weeks. Clinton’s weak polling this year in Nevada compared to President Obama’s strong performances in the state in 2008 and 2012 might be more concerning to her campaign if the state had more than six electoral votes. The contest in Nevada may be closer this year because of Trump’s strength with white voters without a college degree.